Gives comfort to very dry skin. 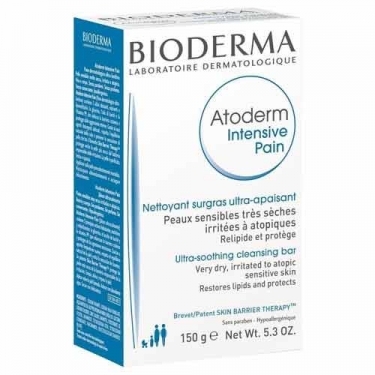 DESCRIPTION: Atoderm Intensive Pain from Bioderma is a soap suitable for hygiene of dry and dehydrated skin. It contains in its formulation glycerin, shea butter and xylitol, which provide a non-delipidating, moisturizing and super-thickening hygiene. Biologically and durably regenerates the skin barrier thanks to the patent Skin Barrier Therapy. It was enriched with zinc sulfate for an anti-bacterial action and rhamnose with a calming action. It respects the physiological balance of the skin and has a calming and anti-bacterial action. No parabens. No preservatives. Without perfume. Hypoallergenic. Apply daily on wet skin, lightly massage and rinse.